Say what you will about reindeer (Rangifer tarandus, trans. ‘No, my nose doesn’t light up, that’s someone else’), there’s no denying that they are the rare mythical creature that actually turns out to be real.1 They consist of six wild subspecies that can be found in Siberia and Norway, as well as Greenland, Alaska and Canada, where they call themselves caribou (a French version of the Mi’kmaq word qalipu, meaning ‘snow-shoveler,’ a dismissive reference to the reindeer’s embarrassing habit of pawing through the snow for food). But though reindeer are indeed very, very real, the vast majority do not lead glamorous lives of working one night out of the year and then spending the remaining 364 days relaxing by Santa’s pool while being generally mythologized by an adoring public. Instead, most reindeer spend their time looking for lichen to eat, migrating constantly, and working catering jobs to make ends meet and pay for their acting and flying classes. Choosing to become a reindeer is to choose a hard life of being prey for wolves, having four stomachs, possessing the second-largest set of antlers after the moose, and being a popular meat in Scandinavian countries. Of all the terrestrial animals, reindeer travel the farthest, making vast, massive migrations over thousands of miles between forest areas in the winter (to look for lichen) and their calving grounds in the spring. Along the way, the average reindeer will take 50 or 60 auditions and land not a single role. Let me send you my headshot. So why do it? Because the passion that burns inside these aspiring sleigh-pullers keeps them from just settling into a career in insurance sales. Reindeer are driven to constantly pursue a chance to audition for Santa’s sleigh one day. It’s a long shot, but the rewards are immense. And so reindeer continue having four stomachs, practicing their accents and stage-fighting skills, doing odd bartending jobs and working at coffee shops, chasing a dream. I only do this job because I heard Mrs. Claus sometimes meets here with her book club. Competition for a sleigh-pulling job is fierce, with every reindeer going out for the same jobs all the time. Even the females get antlers, which is indicative of the pressure to be the ‘perfect’ reindeer (and to find lichen under snow). Compounding the fact that pretty much every single reindeer aspires to someday pull Santa’s sleigh is the simple reality that those jobs open up infrequently. The last addition to the Team was in 1939, when Rudolph was added, but that had far more to do with his bizarre genetic condition. Also his uncle made a few calls on his behalf. So most reindeer are left to migrate constantly and eat lichen. They do have a union, but every time it seems like there might actually be a strike, Prancer and Donner take out an ad in Variety accusing the union leadership of being unreasonable, and soon enough they’ll get a whole bunch of reindeer who haven’t done anything other than temp jobs in years to vote against a strike. Eventually many reindeer give up and end up domesticated in Russia, Scandinavia, or Iceland. A few more join petting zoos. Most, it seems, spend a lot of their time trying to guilt you into coming to their one-reindeer shows. It’s Tuesday at 6:30 pm during rush hour in the middle of downtown. Tickets are $25. See you there. But even as we try to figure out how to get out of seeing their plays, and even as you really, really wish that every reindeer you meet would just stop talking about his or her ‘craft’ all the time, you still respect them for hanging in there and going for what they want, even when pretty much any other animal would hang it up and go back to law school. 1 The other is the Grendel. The swordfish (Xiphias gladius, literally translating to ‘swordfish sword,’ which is confusing but leaves no doubt as to what you need to remember about the swordfish) is one of a small number of animals with swords on their faces.1 Of these, they are by far the most massive, reaching almost fifteen feet in length (much of it sword) and 1,400 pounds in weight (some of it sword).2 They are also the sole member of family Xiphiidae; all the other members of the Xiphiidea family were found dead from sword wounds awhile back, and the police couldn’t make anything stick on their main suspect (the swordfish). A swordfish’s nose sword isn’t for decoration (though it certainly is a lovely nose sword). Instead, the nose sword is an important tool that is useful in a variety of situations, like a Swiss Army Knife that’s always open and has only a blade and no toothpick. The swordfish’s nose sword literally cuts through the water, allowing the swordfish to easily reach speeds of 50 miles per hour (which is especially dangerous since they lack seat belts and they’re waving a pointy sword). This speed, combined with their agility and nose sword, makes them deadly hunters. Contrary to popular belief, swordfish do not ‘spear’ their prey; their hunting technique is to dart through schools of fish, slashing their sword noses around, hacking and/or stunning the confused fish who have never before seen a sword where a nose should be. On a given charge, a swordfish may feast on mackerel, bluefish, hake, herring, squid, giant drumsticks, mead, roast goose, suckling pig, jugs of wine, and sometimes their enemies’ hearts – all the while surrounded by comely serving wenches. Oh, and their eyes and brains are heated (while the rest of them is cold-blooded), improving their vision dramatically and giving them a huge advantage over other fish in the sea. Anyway, the main thing is that eating with a swordfish is a bit of a grab bag, what with all the slashing and hacking. Did you get my dinner party evite? I’m slashing and hacking something special. What say we leave the massive super fast fish with the sword on its face alone and go check out Magic Mountain? In sum, the swordfish is a really impressive animal. Why? Because it is a giant, fast fish that, in lieu of a nose, has a sword coming off its face. 1 Thankfully, the last swordcheetah was killed by former President Theodore Roosevelt in 1909 while on safari with his son Kermit. 3 This is one reason why it’s good to be human. We simply point at the leather-bound menu and the waiter says, ‘Le swordfish soup avec saffron rouille.’ And we nod and that’s all there is to it. The hummingbird (Family Trochilidae, lit. ‘Chill, dude’) is a flapping fiasco whose continued existence is a credit to the tenacity of life, once alive, to continue living, even if it is only for a short three-to-four year lifespan. Overreacted squeals of excitement over a hummingbird showing up at our hummingbird feeders notwithstanding, the truth is that, in all likelihood, the hummingbird suffers from a host of ailments, among them malnourishment, Attention Deficit Disorder (ADD), hypertension, a drug addiction, and a pretty gnarly case of jock itch. Hey guys, the bird that shouldn’t be alive is back! Yet despite being only hours away from starvation at any given moment, the hummingbird cannot calm down and focus. While its teachers describe it as ‘boisterous,’ the truth is that it suffers from a pretty severe case of ADD, and being the only bird in the entire world that can fly backwards, sideways, directly up, directly down, and hover doesn’t help things, either. Its homework is a disaster. Thus, although it’s endemic to the Americas – North, South and Cental – the hummingbird is unable to point out any of these places on a map. Meanwhile, while the anorexia and ADD go undiagnosed, the hummingbird stands most precariously on the edge of a heart attack. Some hummingbirds, during flight, can get their heart rates up to 1260 beats per minute1. Furthermore, some species take about 250 breaths a minute and flap their wings up to 80 times per second. You’d think someone would notice. But no, we find its acute tachycardia cute. Oh look! His heart is gonna explode! The common thread in all this is the hummingbird’s addiction to its drug of choice, floral nectar. Easy to make and disturbingly easy to find, floral nectar is a chemical compound consisting primarily of fructose (a 6-carbon polyhydroxyketone – available over the counter) and sucrose (technically: α-D-glucopyranosyl-(1↔2)-β-D-fructofuranoside – found in packets at any Starbucks). Like opium, it’s made by flowers — all the plants have to do is combine the two saccharide components (usually in the bathtub of a rented house). There’s also a man-made version. Colored bright red to court its hopelessly addicted patrons, this artificial nectar is known on the street by a variety of hummingbird slang terms including: N-train, Sangria del Diablo, Beak Candy, Crimson Tweaker, Beijing Sugar, Kool Aid, Burmese Disco, Potpourri, Big Red, Skrump, Skrimp, Weasel, Cooler, Slurp, The Scarlet Letter, El Capitan, Fraggle Rock, Aqua Roja del Fresno, Sweet Ruby Slipper, and Juice. Yet despite the prevalence, we turn a blind eye, pretending not to see the damage we’re causing. As expected, this nectar addiction further compounds the hummingbird’s already myriad issues. It has no teeth. It has no friends (hummingbirds and robins used to be tight… until the DVD player suddenly disappeared). And really, it has no self control. While all of the hundreds of species of hummingbirds would make excellent subjects for D.A.R.E. posters, the hummingbird constantly promises that it’s going to quit nectar tomorrow, but it never does. And what do we do this whole time? We leave their fix in our backyards. The most impressive fact about hummingbirds may be that they are functional addicts. After all their personal problems and self-destructive behavior (that we encourage), they still somehow manage to hold down their part-time gigs of pollinating plants, eating insects (their rare source of protein) and working the counter at your local adult book store. Oh, and their nests are immaculate. But whatever self-esteem they might have ever had has long ago been replaced by deep, nectar-induced paranoia. But functional or not, we all know how this story ends. Cornered in his nest by a paramilitary army of nectar-running thugs, the hummingbird loads his grenade launcher, blasts through the door and stands at the top of the staircase, screaming over the gunfire (and his 1260-beats-per-minute heart rate). Then he encourages everyone to ‘say hello to my little friend,’ but the accent isn’t quite right and comes off as more Italian than Cuban, and it’s punctuated with awkward silence and a couple half-hearted smiles. Then he gets shot like four hundred times. 1 The average resting human heart rate is 72 bpm. Maybe, after a few Red Bulls (or a liter of floral nectar), and a half hour of wind sprints, you could get it up to 230. But call an ambulance first. The term ‘dung beetle’ encapsulates about 7,000 insect species in the superfamily Scarabaeoidea (trans. ‘You probably don’t want to stay for dinner’) that inhabit every continent except Antarctica, where dung beetles, along with military activities and mineral mining, are banned by international treaty. Dung beetles are so named because their lives revolve around poop. While most animals would react with shame, horror, and possible bites at having a synonym for poop in their name, dung beetles consider it a point of pride. They just love the stuff. Once a dung beetle picks up a whiff of nearby poop with their extremely strong sense of smell, there’s no turning back. To them, the odor of poop is what the scent of a corner pizzeria on a chilly fall evening is to humans, only the pizza is topped with crack and we’re all crack addicts. They love poop that much. There are three main branches within the dung community. There are rollers, who roll their poop finds into spherical balls for later use; tunnellers, who bury the dung wherever they find it for later use; and dwellers, who are so overcome with poop addiction that they simply live in whatever piles of poop they find. 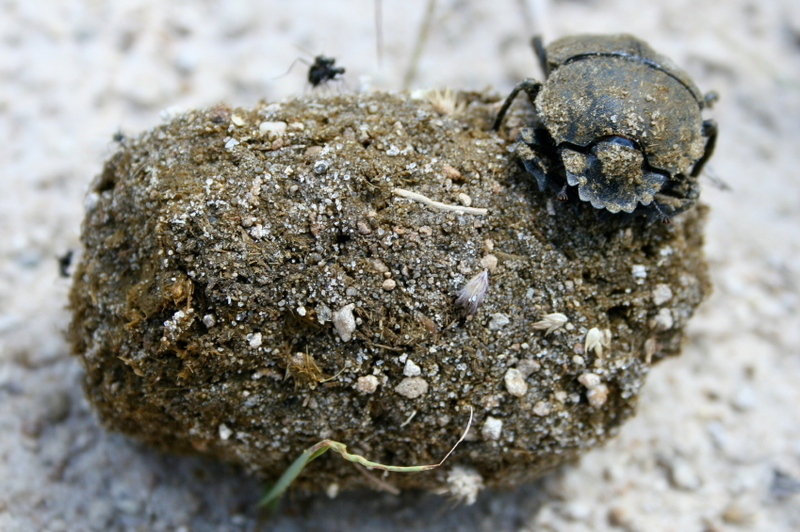 Regardless, all dung beetles share a common trait: an abiding, irrepressible love of poop. How much do they love it? Well, let’s just say that one dung beetle can move 250 times its body weight in poop in a single night. And let’s just say that dung beetles are known to steal each other’s poop balls. And let’s just also say that one researcher observed a three pound mound of elephant poop carried away by 16,000 dung beetles in under two hours. And let’s especially also say that that researcher spent the rest of that day wondering why graduate school ever seemed like a good idea. In terms of what that ‘later use’ is, it’s pretty straightforward: dung beetles eat the poop. The balls of poop they roll are simply being set aside for later consumption. Dung beetles do not eat or drink anything else, as the poop provides all the nutrients they need. 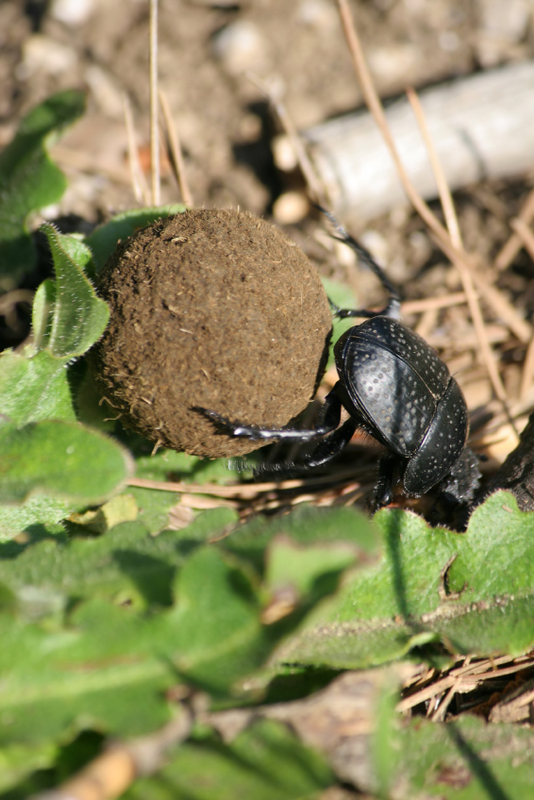 The poop balls are also used as ‘brooding balls,’ which means that dung beetles lay their eggs inside the poop ball, cover it in more poop, and their future larvae, upon being born, have a whole ball of poop to feast upon. As much as poop is central to the dung beetle’s identity, these are not just one-dimensional bugs. They have hidden sides, like a lumberjack who reads poetry. Dung beetles read poetry too, though, to be fair, most of the poems are about poop (‘Shall I compare thee to a ball of poop?’ is oft-quoted in many a dung beetle love letter). Beyond that, dung beetles spend their free time enjoying walks (looking for poop to roll), contemplating poop, talking about poop, reading about poop, and surfing. I also whittle. But nobody ever talks about that. But what’s in a name? Well, unfortunately for dung beetles, a lot (cf. ladybugs). 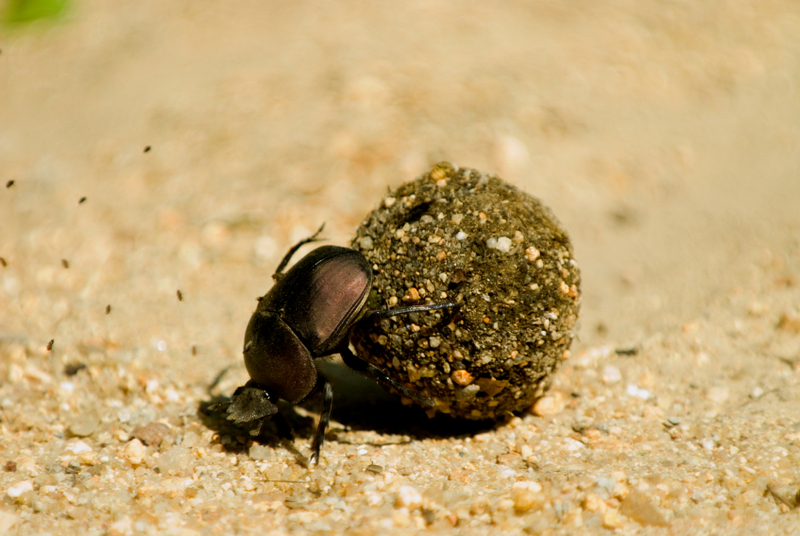 But as immediate as the mental connection to poop is when talking about (or to) dung beetles, it is important not to forget that the world needs poop-rollers too. Dung beetles are important parts of ecosystems, getting poop out of the way so other species can go about their lives without stepping in it. They contribute to soil health by reintroducing nutrients from the poop. And dung beetles have even been introduced to agricultural landscapes to deal with cow poop issues that might otherwise harbor germs and parasites. 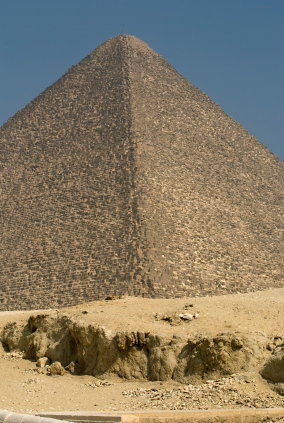 In fact, were it not for dung beetles, the entire earth would be covered in a layer of poop (except for Antarctica). After we’re done here, let’s move on to those beetles that eat poop and also invent beer. Beyond Egypt, there is Aesop’s fable “The Dung Beetle and the Eagle,” which involves an extremely confusing storyline about a dung beetle, an eagle, a hare (which gets eaten by the eagle, which for some reasons upsets the dung beetle, who retaliates against the eagle), and Zeus. In Franz Kafka’s The Metamorphosis, Gregor Samsa is said to turn into ‘an old dung beetle.’ Then there’s the ill-fated 1970’s children’s book series Dung Beetles At The Disco, which was really more of a tribute to the disco culture and an allegory about the dangers of trampling than a paean to the dung beetle. So next time you’re at a cocktail party and someone starts gossiping about dung beetles, consider standing up for the little poop-rollers. They’re doing all of us a big favor by obsessing over poop, and they deserve more than our respect – they also deserve a name change. Until someone suggests a better name than Hey Somebody’s Gotta Do It Beetles, we’re sticking with that. And if you ever see a dung beetle hard at work on a pile of poop, take a moment to tell them, ‘Just so you know, I love you like a fat kid loves cake, which is almost as much as you love poop.’ They’ll appreciate the kind words.